Ok, so you think that Americans are fat and lazy?...you may have a point. But do you know why we're fat and lazy? Because we are inventive...and when you are as inventive as Americans, your ingenuity leads to more enjoyment and less work...and unfortunately for us, enjoyment and less work may lead to fatness and laziness. So we're not fat and lazy for the sake of sloth, but merely because we are so smart, hard-working and inventive. But, hey, the proof is in the proverbial puddin', right? That's right! 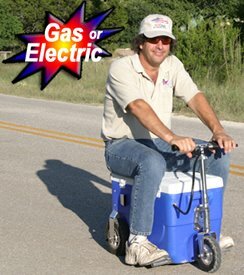 The Cruizin Cooler is either gas or electric and gets you where you need to go with maximum efficiency. Cruzin Cooler combines two basic necessities of life, the ability to have cold food or a beverage handy along with the means to get somewhere, without walking. Enough said...you Euro-rail-thinners take your smart cars and shove 'em...I'll take the Cruizin Cooler any day.